What other interests do you have besides writing? Have you ever wondered how you could include them in your writing process? Let’s discuss! My blog post on learning about writing from other disciplines. In his book No Plot? No Problem! Chris Baty describes this exercise as the Magna Carta list. I call it books that make my heart hurt, and it’s a great way to determine which story elements from your favorite book really resonate with you as a reader, so you can use them in your own writing. When I was a teenager, I carried a spiral notebook or a set of ten loose ruled pages stapled together and folded in half on my person at all times. 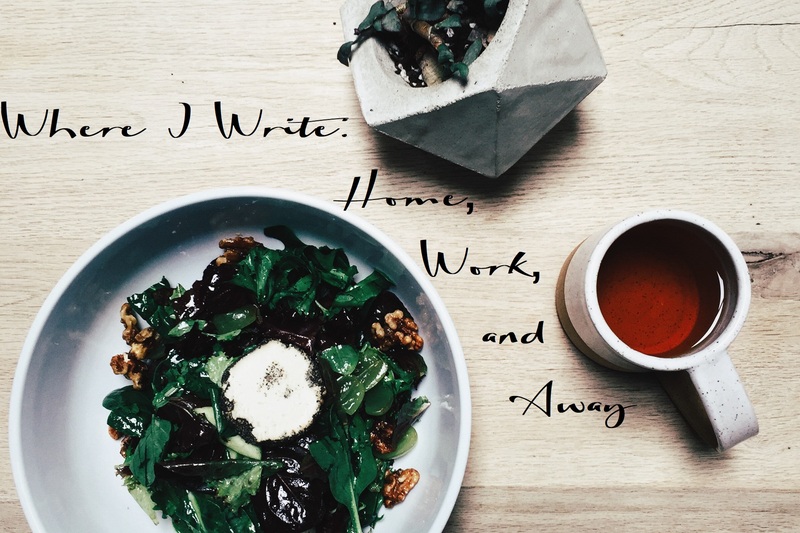 I could write anywhere – in the car, while waiting for my parents, while waiting for an appointment, during classes or other events, and everything in between. While I didn’t keep track of things like this back then, it’s likely that I wrote every day, even if only a few lines or paragraphs. Now, I find that I need a little more time. I need to get my head in the game, and it takes a bit more effort. So I thought I’d make a list of places where I have found my writing endeavors successful. Home office – one small bedroom in my house contains a few bookcases and two desks, one for me and one for my husband. We like the setup because it reminds us of the tables we used to work at in our college library, but we are hardly ever at our desks at the same time. I find that I am able to work well in this space, but that I don’t take advantage of it as much as I could. If there were space in one of our living areas, less separated from the rest of the house, I think I might use a desk there more often. Work office – as a full-time instructor last year, I had the pleasure of a nice sized office with a view over the pond all to myself. I found that during class days it was difficult to switch from teacher/grader to creative writer, but I occasionally made special trips in on the weekends or off days, and they proved to be quite productive. I found this space especially useful for full manuscript revisions, because I had plenty of space to lay out pages and pages of manuscript. Yard – at home, when the weather is nice I like to write outside. Whether in a shaded rocker, around the fire pit, or just outside on the deck, nature and fresh air are inspiring to me. I try to take advantage of this as much as possible. Coffee shops – of course, coffee shops. I live dangerously close to a Panera Bread, but if I drive a bit farther there are several local options. It’s true that the sense of business, coming and going, and other people with laptops set up to work on their own projects definitely put me in the right head space to work. I thought I’d also mention some places that seem as if they should be good places to write, but where I have found that for one reason or another I just couldn’t get into my manuscript. Public libraries – I’m not sure what’s different about the comings and goings at a library compared to a coffee shop. Perhaps it’s the expectation of silence, or the separateness of the little homework rooms (usually the best bet for an outlet). I’ve given this a try on many occasions, and it never proves as productive as I’d expect. The beach – okay, maybe this isn’t an obvious writing spot! But since I can be so productive in my yard, I’ve tried the beach. Didn’t quite work… I wonder why? With a friend I haven’t seen for a while – even two writers (or even two people who just have things to do) can be caught spending more time catching up and sharing about what they are working on then doing any actual writing. I still think this is a worthwhile thing to do, I just have different expectations about getting things done when doing it. Where do you like to write? Anywhere I didn’t mention? Let me know! Have you ever heard of a “foil” in literature before? Or wondered what all of those other characters do for a story while the protagonist and antagonist are locked in their epic struggle? Let’s look at some examples! Have you ever wondered how the picture books you read to your kids are written, or thought about writing one yourself? Here are some general rules you need to know to set yourself up for success! Side note: if you think it’s easy, it’s not. Here are some recent reads I’ve really enjoyed, and I think you will too! 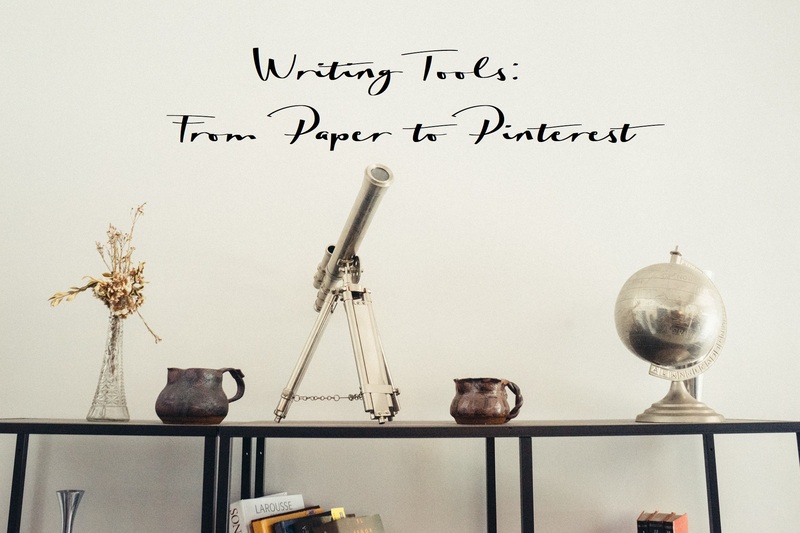 Every writer has favorite tools that help them hone their craft. From fancy computer programs to simple notebooks, here’s a list of tools I use or have used in the past, and what I like about them. Pen and Paper – the old standard is still necessary for writers today! Even though I do most of my drafting with a keyboard rather than a pen, a good notebook is essential for brainstorming, outlining, and questioning a story. Often when I find myself stuck on a given work in progress, it isn’t until I go back to a pen in my hand and work through a bit of a draft long form that I am able to pull out of the slump. I use rollerball pens, and my favorite notebooks are the softcover ones with the stitched spines, like these. Caffeine – the writer’s vice. But hey, it’s better than alcohol, right? A good cup of coffee or tea is nectar from the writing muse. Headphones or earbuds – sometimes I will sit at a desk or table for a half hour or more and wonder why I’m not making any progress – just can’t get into the swing of the writing thing. Then I realize, wait, there’s no music! Plug these babies in and watch the word count rise. Pandora – what to listen to? I usually don’t enjoy writing to music with lyrics, unless it is a specific genre to help me get into the right mood or headspace for a certain character or setting. My standby writing music comes from two Pandora stations. The first one is made of action movie soundtracks, and gets my blood going for those stories or scenes with a lot of action or tension involved. The second is comprised of piano-based music. I love this type of music because listening to the keys of a piano helps my fingers to keep typing away at the keys of a keyboard. Rainy Mood – if, for whatever reason, I don’t want to listen to music but I want some background noise, I use the website RainyMood.com, which plays a variety of rainy day sounds, from a light drizzle to a downpour to a thunderstorm. Scrivener – if you haven’t heard of Scrivener before, it is a computer software especially for writers. You can split your manuscript into easily accessible chapters and scenes, tag sections by setting, character, or timeline, link character profiles, store research and notes, view a “pinboard” or longform outline… and so much more. Yes, that’s a lot! This program can be overwhelming for me, especially in the drafting phase. It is easy to be so distracted by all the different settings, color codes, cross-references, etc that hours can go by without any actual writing happening! I think it is a great program that is really useful for lengthy WIPs that include multiple points of view or timelines, and a lot of characters. Microsoft Word – the basic word processor, MS Word is still my preferred place to type and format a manuscript. Since agents and publishers will expect Microsoft Word files if they request your work, it’s nice to know that my manuscripts are already in the correct format and meet publishing world standards. Write or Die – this free tool is really useful if you are on a deadline or trying to meet a self-made goal. The online program is free, and it provides a text box where you type for a given amount of time and attempt to reach a certain goal. If you stop typing, the page gradually turns red, and eventually plays and obnoxious sound to get you typing away again. Just make sure you save your work at the end! Pinterest – when I’m working on a manuscript, especially in the beginning stages, I like to create a Pinterest board to collect images that put me in the headspace of that story. Whether it’s photos of people who remind me of my characters, images of settings I plan to use, artwork that fits the mood of the story, or links to websites with useful information and research, it’s nice to have it all in one place. If I have to take some time away from a WIP, I like to go back and look at this board to get into the right frame of mind before starting up again. Library Card – writers read, and boy am I glad we can do it for free. Bookstore – as wonderful as libraries are, they can have a bit of a clinical feel. People have meetings, do homework, come in to use the computer, etc in a library, so there’s something nice about bookstores – where the focus is solely on books purely for the sake of books! What tools do you find important to your writing process? Any that I didn’t mention? Let me know! Have you ever wondered what the terms “protagonist” and “antagonist” mean? What about the difference between the protagonist, the narrator, and the main character? This is the video for you! We’ll even look at examples like The Great Gatsby, Sherlock Holmes, and Star Wars: The Force Awakens. What is the difference between a short story and a novel? How does a writer approach each type of story? What are some examples of good short stories? Find the answers to all this and more in today’s video.